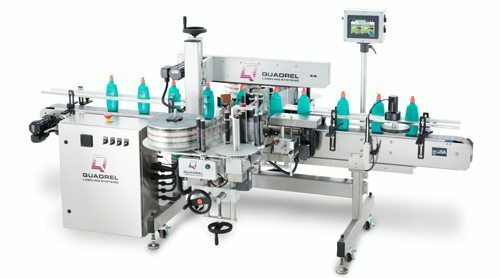 Quadrel’s TechLine labeling system was designed to provide companies with state-of-the-art, cutting edge technology in a medium priced labeling system. Available in front/back/wrap or custom configurations, TechLine comes standard with features not normally found on systems at this price point. Standard features include Allen-Bradley© PLC control and color touchscreen operator interface, stainless steel construction, digital frequency controlled product handling and Ethernet capabilities. This technically advanced front, back labeling system is designed to accommodate a wide variety of flat panel or oval containers. Features include a color touchscreen operator interface, Allen-Bradley© PLC control and stainless steel construction with speeds up to 250 products per minute depending on product size. 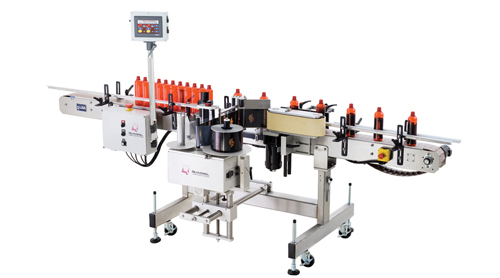 This full-featured automatic wrap labeling system is designed to accommodate a wide variety of round containers. Features include a color touchscreen operator interface, Allen-Bradley© PLC control and stainless steel construction with production rates up to 200 products per minute depending on product size.